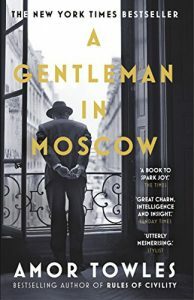 We have just read A Gentleman in Moscow for our February book … I loved it so much I just wanted to start and read it all over again. I am so pleased you like it too . What a lovely piece of synchronicity, Helen! Yes, I am sure I will want to reread A Gentleman in Moscow. It was marvellous. Thanks, Margot. It’s very nice, too, to have a chance to discuss a book that you’ve enjoyed – or even that you haven;t enjoyed! Suggestion for your book group: Reservoir 13 by Jon McGregor. My book club loved it. Thanks, Patricia. It’s been on my radar for a while and I will bear it in mind when it is my turn to suggest books. Lovely to hear from you. Yes, it’s good to be taken out of one’s comfort zone now and again and who knows – as writers anything might spark an idea for us! Yes, that annoys me too and I am not very forgiving about careless research. But I only really spotted one thing that struck me as wrong and it wasn’t a very important thing. I haven’t enjoyed a new book as much for ages. I just surrendered to it and was carried along.